A voter enters the Hamilton County Election Commission for early voting on Wednesday, Feb. 22, 2017. 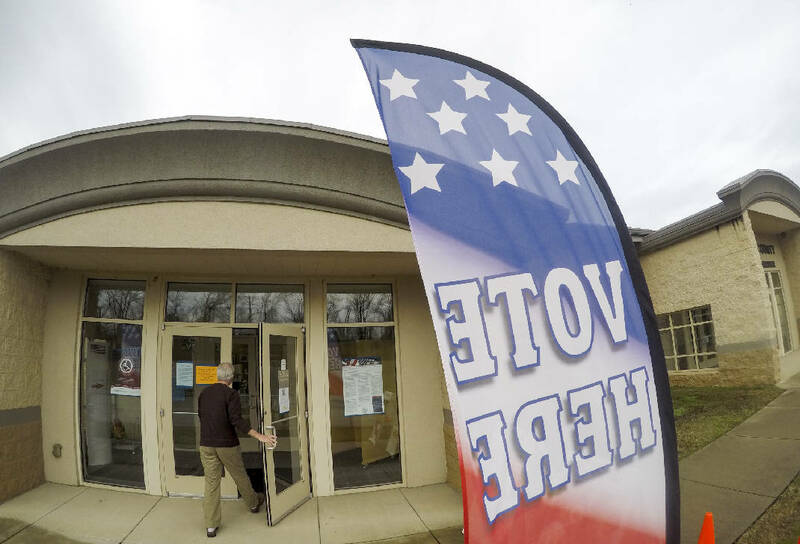 Early voting starts Wednesday for Hamilton County primary elections and voters will see contests in three countywide races — for county mayor, a Circuit Court judgeship, and the register of deeds office — and four county commission races. Incumbent Randy Fairbanks is seeking a second term, while challenger Steve Coker is hoping to upset him in the Republican primary. Fairbanks, 61, won the seat in 2014 after toppling longtime commissioner Fred Skillern in the primary and besting a write-in campaign by school board member and Skillern ally Rhonda Thurman. A certified public accountant who is now the commission chairman, Fairbanks said he has focused closely on district residents' concerns and spends a lot of time at events. Voters need to bring photo ID issued by the state or federal government. See a sample ballot at tinyurl.com/y75cof22. Sample ballot for the 2018 Hamilton County Democratic Primary Election. Sample ballot for the 2018 Hamilton County Republican Primary Election. "If I'm physically able, I'm there," he said. In his first term he has worked to support volunteer fire departments in northern Hamilton County and has been an advocate for the schools as well as a strong supporter of municipalities, he said. He also serves on the Chattanooga Convention and Visitors Bureau board and the River City board. Fairbanks was among the eight commissioners who voted to raise property taxes last year to pay for new and renovated schools and a wastewater treatment plant to be built in the county's north end. Last year's budget and the schools facilities plan, both developed and approved with little or no public input, and the last-minute tax increase all reflect the need for greater transparency, he said. And the timing wasn't good, just ahead of an election year, he added. But "when you have to raise taxes and you're doing it for the correct reason that people can see, you don't have a problem." Fairbanks said he agreed to the tax hike only when he got a guarantee the county also would adopt property tax protection for low-income senior citizens. If re-elected, he said, he wants to move forward on a track for Soddy-Daisy High School that will be a "community track" for Sale Creek, as well. The fire hall on Mowbray Mountain is in "bad, bad shape" and needs replacing, he said. "I view my role as commissioner as helping people who need help," he said. "You can't do everything. You talk about a huge responsibility, it's us up there choosing who gets this and who gets that." If helping, especially helping schools, meant another tax increase, he said, "It'd be tough two years in a row, but I'd never say never." Challenger Steve Coker would say never in a heartbeat. "No. If that was brought up, then I would be bringing up stuff and asking a lot of questions," said Coker, 66, who will retire this month from the telecommunications department in Hamilton County government. The U.S. Army veteran worked on communications in the Signal Corps and earned an electronics technician degree after his service. Coker said he decided to run after a lot of people told him the northern end of District 1 wasn't being adequately represented. "If I was to be elected, I would make myself available not just to Soddy-Daisy but also Sale Creek, I would be up there and allow people to talk to me. That's something I'm really into, is listening to what the people want. If he wins office, he said, he'd start by asking working people, schools and businesses what they want their county government to do. The county has five of the lowest-performing schools in the state, and while a lot of solutions have been pitched, "my idea is to address the kids, find out what they need and want. Everybody's trying to fix the left-hand side of the equation but not the right — what would get them interested in doing better?" He also sees the potential for economic development in the district. "One of the most available areas for growth is the Sale Creek area, I would like to see what I can do to help that growth," Coker said. "People up there are for it, if we could draw in more businesses, like we did for Volks- wagen, with tax breaks." He's done a lot of work in Hamilton County Schools buildings and says that inside knowledge would help him ask the right questions on the commission. District 1 communities are Bakewell, Dallas, Falling Water, Flat Top Mountain, Mowbray and Soddy-Daisy. Incumbent Warren Mackey, a Democrat, said he's seeking a fourth term because there's still work to do to fix schools, train a workforce and grow more jobs, and try to make government work better. "I will be pushing for ways to get a trained workforce [and] supporting programs where the public schools are producing a better product," said Mackey, 68, who taught history for 38 years at Chattanooga State. He also said colleges with teacher prep programs must "do a better job of getting those teachers ready to teach." He said he's very impressed with Hamilton County Schools Superintendent Dr. Bryan Johnson and works closely with his school board counterpart, Tiffanie Robinson, on education issues. "The Future Ready Institutes [vocational academies inside high schools] are a marvelous, wonderful idea. We're getting kids ready for the jobs of the future." And it will promote voluntary integration in public schools, "which needs to happen," he said. Mackey said he has focused hard on economic development. He remembered a controversial tax increase in his first term to generate development funding for Enterprise South. He said Toyota and Kia passed on the site because it wasn't ready. The Volkswagen assembly plant "was our last chance to get the big fish," he said. Now the plant employees 3,400 people and is growing, as are its suppliers. "We were criticized at the time ... but the critics, where are they now? Those are good-paying jobs, that people can raise a family on," Mackey said. "Look at where we were when I came into office and where we are now. It's not an accident." There's a lot more to be done, he said. Schools need equitable funding so kids in all classes, not just some, can have access to electronic learning. The roads are "nearing gridlock." Someone needs to look at planning policies that stymie construction of affordable housing. Mackey said he has made "strong decisions," as evidenced by his service on the Tennessee and national associations of county commissioners. "Why switch horses in the middle of the stream? If our economy is going well, why would you want to disrupt what has taken place?" he asked. His primary challenger, Kelvin Scott, said he has 18 years of boots-on-the-ground service in the district and sees its problems and needs from street level. Scott, 48, owns a small business and has about two more years of classes for his degree in Christian leadership from Antioch Christian University. He spent 10 years in the U.S. Army and said he is a certified Equal Employment Opportunity adviser, a master facilitator and has anger management training certification through Howard University. He's been a substitute teacher and high school coach and now runs a GED program at Olivet Baptist Church, where he also helps felons get their records expunged and find jobs. He said 19 percent of district residents don't have high school diplomas. "Basically, I'm helping the community already. I'm actually already doing it," Scott said. In working with Bishop Kevin Adams over 18 years, "I've had an opportunity to listen to the people, get their concerns." If elected, he said, he would work closely with Robinson and schools officials to bring up low-performing schools with good teachers and up-to-date textbooks and technology. He also would spread the progress he sees in parts of District 4 throughout the whole district, he said. The Southside is "doing well, growing, good standard of living," he said. So is the M.L. King area, "but we don't see that same thriving in the East Lake, East Chattanooga part of town. I believe true prosperity is when everyone is achieving together." He would try to make that happen by focusing on specific, construction-related job training that teaches high-paying skills, and by helping small businesses develop capacity so they can compete for projects. "We want housing to grow and become better, as well as have the people in that area better employed, better able to take care of their families. When you have jobs, that brings crime down," Scott said. Asked why voters should choose him over the long-term incumbent, Scott said, "change is not always bad." He said the district has the largest number of low-performing schools and that Mackey has "accountability for money being adequately spent" to improve them. "Change has to take place, accountability has to take place, and the people have to know they're being fought for and their voice is being heard." District 4 communities are Alton Park, Amnicola, Avondale, Bushtown, East Chattanooga 2, East Lake, Eastside, Kingspoint 2, Murray Hills and Ridgedale. Another veteran commissioner is facing a challenge this year. Greg Beck, who has served on the commission since 2005, is seeking a fourth full term. Political newcomer Katherlyn Geter is hoping to upset him in the Democratic primary. Beck, 70, worked as a police officer and court officer and has seen the impacts of crime and poverty up close. His long service on the commission has given him perspective and earned him valuable influence, he said. He said he has several projects he'd like to see completed in the coming term, including the renovation of Tyner High School to house the Chattanooga School for the Liberal Arts and a new Harrison Elementary School, the "pride and joy" of District 5. Commissioners voted last year to raise property taxes and fund $110 million worth of new and renovated schools. "There's a lot of stuff I want to be a part of, and I would hope the voters would see it like that and want to keep me on," Beck said. He said his constituents are worried about crime and school safety, and he favors paying to place school resource officers in all 79 county schools. "I think we need as much protection as we can get," he said, but he thinks the county can afford to "build a fortress around our kids" without raising taxes. He's also working on an idea to redevelop Hillcrest Elementary into a vocational school once its students are absorbed into the new Harrison Elementary. Beck said the Bonny Oaks area is growing fast thanks to development around the Enterprise South industrial park. Property values, stagnant for years, are now "sky high," he said, and only about 10 parcels are left for development along Bonny Oaks Drive. "There's lots of building going on and people moving in, and I'm happy about that," he said. "I don't know what party persuasion they are but they're here and they're taxpayers, they're welcome." He added that he has been endorsed by the Home Builders Association of Southeast Tennessee. Geter, a longtime health care advocate and navigator, said her work with Family and Children's Services, Erlanger and the Area Agency on Aging has allowed her to "see firsthand the reality individuals are living." A single mother of two sons, Geter, 43, said she'll do a better job connecting with District 5 residents and with her school board counterpart, Karitsa Mosley Jones. The district includes three of the county's lowest-performing schools. Those residents are telling her they're ready for a change, she said. "They are tired of individuals getting elected to a seat and they never come back to the community and engage with them — they only see them at election time," Geter said. Most District 5 residents are working single mothers who don't have time to come to Wednesday morning commission meetings, she said. She would build relationships to communicate with those voters and connect people and organizations. Geter said Jones has expressed disappointment at having little relationship with Beck, but the commissioner said he and Jones "do as much as they can" and he tries "to stay out of the way a lot of the times." She wants to focus on strengthening schools and bolster inclusion in special education programs. She also sees a need for more transparency on the commission. "People have to feel they are a part of this — I think that's why we have this problem" of little public engagement with the commission. Beck supporters have criticized Geter for not living in District 5, but she said she works and attends church in the district and will move there if she's elected. District 5 communities are Airport, Bonny Oaks, Dalewood, East Chattanooga 2, Eastdale, Eastgate, Glenwood, Kingspoint 1 and 3, Lake Hills, Ridgeside, Summit 1, 2 and 4, Tyner 1, and Woodmore. The noisiest primary battle on the commission is between Republican incumbent Tim Boyd and challenger Brent Lambert. Boyd, 65, is an East Ridge native and engineer with Aquafil USA in Cartersville, Ga., where he has managed more than $40 million in capital projects since 2013, according to his biography. In two terms on the commission, Boyd's relentless questioning of agencies such as the county's Water and Wastewater Treatment Authority and the Chattanooga Convention and Visitors Bureau forced changes in those bodies even as it irritated their leadership. He frequently questions county spending and initiatives and was the lone vote against last year's tax increase because he said it happened without public input. Lambert, 41, is also a native of East Ridge and now is the mayor of his hometown. He touts the rapid growth in and near the city, spurred in part by a legislative sales tax break that helps pay for local development. But after Lambert accepted $5,000 in campaign contributions last year, including $3,000 from Exit 1 developers, he says Boyd threatened him and tried to force him to drop out of the commission race. Lambert filed a complaint with the district attorney's office, which said it asked the Tennessee Bureau of Investigation to look into the allegation. Boyd denied any threat, saying he merely told Lambert that even though the contributions were legal, they would reflect badly on him, his family and his employer. No Democrat is seeking the seat, so the primary winner will take office Sept. 1. District 8 communities are Brainerd, Brainerd Hills, Concord 1, 2, 3, 4 and 6, East Ridge and Missionary Ridge. In the mayor's race, two Democrats are seeking the right to challenge incumbent Republican Jim Coppinger, who is seeking a second full term. The county mayor oversees a budget near $725 million and more than 1,700 employees. Coppinger said the county has added more than 14,628 jobs and more than $2.2 billion in new investment since 2011, as well as almost 22,000 new residents. Aloyse Brown, 40, of Lookout Mountain, is making her first run for political office. She manages a nonprofit financial services organization and says that experience with multimillion-dollar accounts will help her manage the county's budget. She said she has the intelligence, passion and drive to move the county forward. Her goals are to improve schools, especially teacher salaries and early childhood education, and reduce inequities in classrooms; to upgrade public safety and infrastructure, and to aim for criminal justice reform. "I'm looking to create a world for my children and their friends in which they can have a future I can be proud of," Brown said. George Ryan Love is a former teacher with a master's degree who became disabled. He said that, earning $9.70 an hour as a part-time cashier at Erlanger hospital, he's the only candidate living at the poverty line. Love ran unsuccessfully for the 3rd District seat in Congress in 2016. "People deserve a change, and the people in power aren't affected by these issues as we are," Love said. "That's why I'm on the ballot, in a nutshell. ... My slogan is, 'Put the 'public' back in public office.'" In the Republican primary for Circuit Court Division 4, Catherine "Cate" White is hoping to unseat Kyle Hedrick, who was appointed to the position by Gov. Bill Haslam after former Judge Neil Thomas retired. The election is for the remaining four years of the term. Hedrick is a veteran defense attorney and White has spent her career in family law and mediation. Since no Democrat is running, the primary winner will effectively be elected and take office Sept. 1. The main issue for two Republicans running for register of deeds is whether to reduce or scrap altogether a $50 monthly fee for online access to records held by the office. Register of deeds is a county constitutional office that makes and preserves records such as deeds, mortgages, liens, contracts, plats, leases, judgments, wills, court orders, and other transactions that affect the public interest. State Rep. Marc Gravitt, of East Ridge, and longtime Hamilton County Assessor of Property employee Randy Johnson are competing in the Republican primary. The winner will face Democrat Vickie Schroyer in August. Gravitt has claimed the endorsement of retiring incumbent Pam Hurst. The former U.S. Army sergeant served on the East Ridge City Council and as vice mayor before being elected to the state House in 2014. He is a licensed Realtor and the owner of Gravitt Auctions and Appraisals. Johnston is director of residential property in the assessor's office, where he has worked for 33 years. He sought the top spot there when longtime assessor Bill Bennett retired in 2016 but lost to Marty Haynes in the primary. Both men say Hurst is leaving the office in good shape; both say they would invest in technology to make sure it stays up to date and delivers top-notch service to the public. Gravitt says the online fee should be reduced, maybe by half, saying the register's "is a fee-based office, but government is not here to make money off of citizens." If elected, he said, he'll take six months to study the issue before acting. Johnston wants to cut the fee altogether. "I just think that taxpayers pay enough," he said. In three other commission districts, the contests will take place in August. In District 2, incumbent Jim Fields is not seeking re-election. The contest will be between Republican Chip Baker and Democrat Elizabeth Baker, who are not related. In District 3, incumbent Republican Greg Martin faces Democrat Rosabell Gorman, and in District 6, Republican incumbent Joe Graham faces Democrat David Sharp. Sabrena Smedley in District 7 and Chester Bankston in District 9 are unopposed. Also unopposed are County Trustee Bill Hullander, Circuit Court Clerk Larry L. Henry, Criminal Court Clerk Vince Dean, Juvenile Court Clerk Gary Behler and County Clerk Bill Knowles. In the sheriff's race, incumbent Republican Jim Hammond will face Democrat Victor Miller.